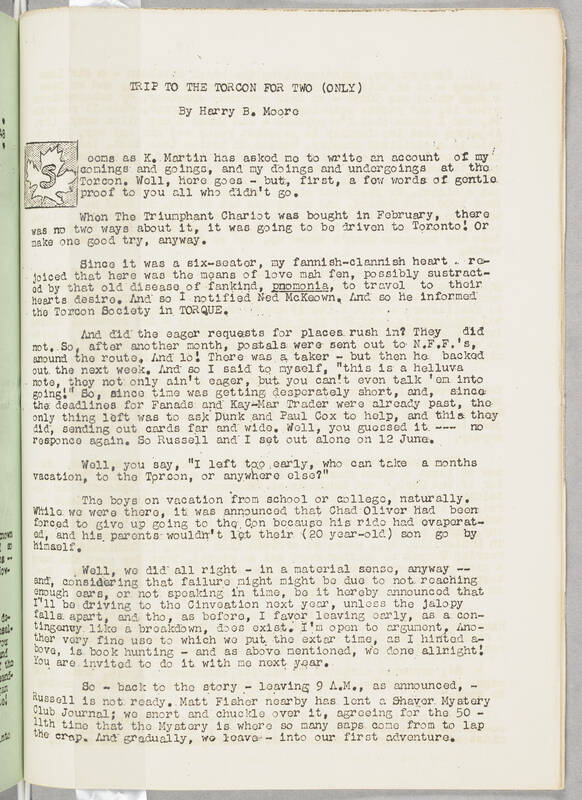 TRIP TO THE TORCON FOR TWO (ONLY) By Harry B. Moore Seems as K. Martin has asked me to write an account of my comings and goings, and my doings and undergoings at the Torcon. Well, here goes - but, first, a few words of gentle proof to you all who didn't go. When The Triumphant Chariot was brought in February, there was no two ways about it, it was going to be driven to Toronto! Or make one good try, anyway. Since it was a six-seater, my fannish-clannish hear rejoiced that here was the means of love mah fen, possible sustracted by that old disease of fankind, pnomonia, to travel to their hearts desire. And so I notified Ned McKeown. And so he informed the Torcon Society in TORQUE. And did the eager requests for places rush in? They did not. So, after another moneth, postals were sent out to the N.F.F. 's around the route. And lo! There was a taker - but then he backed out the next week. And so I said to myself, "this is a helluva note, they not only ain't eager, but you can't even talk 'em into going!" So, since time was getting desperately short, and, sice the deadlines for Fanads and Kay-Mar Trader were already past, the only thing left was to ask Dunk and Paul Cox to help, and this they did, sending out cards far and wide. Well, you guess it --- no response again. So Russell and I set out alone on 12 June. Well, you say, "I left too early, who can take a months vacation, to the Torcon, or anywhere else?" The boys on vacation for school or college, naturally. While we were there, it was announced that Chad Oliver had been forced to give up going to the Con banquet because his ride had evaporated, and his parents wouldn't let their (20 year-old) son go by himself. Well, we did all right - in a material sense, anyway - and, considering that failure might might be due to not reaching enough cars, or not speaking in time, be it hearby announced that I'll be driving to the Cinveation next year, unless the jalopy falls apart, and the, as before, I favor leaving early, as a contingency like a breakdown, does exist. I'm open to argument. Another very fine use to which we put the extra time, as I hinted above, is book hunting - and as above mentioned, we done alright! You are invited to do it with us next year. So - back to the story - leaving 9 A.M., as announced, - Russell is not ready. Matt Fisher nearby has lent a Shaver Mystery Club Journal; we snort and chuckle over it, agreeing for the 50 - 11th time that the Mystery is where so many saps come from to lap the crap. And gradually, we leave - into our first adventure.